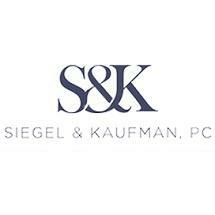 At Siegel & Kaufman, P.C., in Stamford, Connecticut, we focus solely on family law, and we are fully committed to helping our clients protect their rights and interests in the face of some of life's most difficult, emotional and complex legal challenges. When working with our law firm, you will receive the benefit of working with highly rated and award-winning attorneys who are totally devoted to protecting your rights and interests while helping you achieve the most favorable outcome possible. As effective negotiators, we will strive to help you resolve your conflicts and reach viable agreements through alternative forms of dispute resolution, thereby avoiding the cost and stress of protracted courtroom battles. Should your situation require litigation, however, we are prepared to aggressively advocate on your behalf in court. In all cases, we are here for you, and our law firm has earned a reputation as one of the top in the region for all family law and domestic relations matters. To find out more, please contact Siegel & Kaufman, P.C., to schedule an initial consultation.